Older adults face numerous health problems that younger adults never imagine. Since eating is an essential daily activity that most of us think of as pleasurable, one of the most upsetting problems of aging is difficulty swallowing, which can change meal time from an enjoyable pastime to a difficult challenge, and can eventually cause very serious health problems. Serious swallowing problems can also occur with Parkinson’s disease and other neurological conditions, reflux disease, stroke, head or spinal cord injury, or cancer of the head, neck or esophagus. Is there anything you can do to prevent swallowing difficulties before they develop in older adults? Is the use of thickeners proven to be safe and effective for the elderly? What thickeners are best for which patients? Swallowing difficulties caused by neurological diseases, stroke, or cancer are very difficult to prevent. Many swallowing difficulties can’t be prevented, but some swallowing difficulties attributed to aging and dementia can be delayed or prevented by reducing tooth loss and sedation. Tooth Loss. Having fewer teeth makes it more difficult to adequately chew food, and this makes it harder to swallow food. As people age, they may forget to brush their teeth as often or as carefully as they used to, and a common side effect of many prescription medications is dry mouth, which also leads to tooth loss. Reducing the use of unnecessary medications that cause dry mouth could be very effective. In addition, reminders by caregivers to brush teeth after every meal can increase the likelihood that a person will brush his or her teeth at least once a day. Sedation. Atypical antipsychotic medications such as Seroquel, Abilify, Zyprexa, and Geodon, are frequently prescribed to elderly patients who are depressed or agitated despite warnings about their risks. These drugs are often chosen because they tend to cause sedation, which may calm an elderly person but is a well-established cause of swallowing problems. The products sold as commercial thickeners come in different textures and flavors, so you can try different ones to see which one your family member or patients like best. Thickeners are intended to be used with beverages. You don’t need to use commercial thickeners for foods, since soup and other foods can be easily thickened with powdered potatoes (used for instant mashed potatoes), rice cereal, tapioca, or Jell-O, for example. If the person you’re caring for is losing weight, feeling full too quickly, or choking on thickened foods, stop using them and talk to the doctor about other options. Extremely Thick, also called Pudding Thick, Mousse, or extra thick, can’t be poured and must be eaten with a spoon. There are no serious concerns about the safety of thickeners for adults. The only known risk is if the patient refuses thickened fluids, which could potentially cause dehydration. For that reason, it is important to balance the need for thickened fluids with the effort to find a product that the patient likes. A study of speech pathologists found that most recommend thickeners for patients with swallowing disorders, even if they have never read a study indicating that their patients will benefit. One-third used pre-thickened liquids, and those who mixed the drinks themselves often were not well trained to use it and usually made the liquids too thick or too thin, especially when trying to achieve honey thickness. The choice of which thickener to use did not seem to be related to which the patients preferred, and many of the patients were not happy with the thickened liquids. Since patients had no say in which thickeners were used by those speech pathologists, it is impossible to know if the patients would have preferred other thickeners to Thicken Up, Thick It, and Thick & Easy, the three powdered products that were used by almost two-thirds of the providers. Speech pathologists in those studies reported that patients were more neutral about nectar thickness fluids, and more negative about the thicker fluids. Researchers from Northwestern University hypothesized that dementia patients and Parkinson’s patients might be better off with changing the way they swallowed rather than using a thickener. They studied 711 patients with swallowing problems who were between the ages of 50-95. All the patients were studied using 3 different strategies for reducing aspiration: putting their chin down while drinking thin liquid, nectar thick liquids with a spoon or cup, or honey thick liquids with a spoon or cup. The researchers were surprised to find that the thickened liquids reduced the chances of aspiration more than merely placing the chin down while swallowing, with the honey-thick fluids least likely to cause aspiration. The Parkinson’s patients in that study were asked what strategy they preferred; the dementia patients weren’t asked because of concerns that they could not accurately recall the three strategies. Unfortunately, the patients preferred the least effective strategy (chin down posture) and their least favorite strategy was the most effective (honey thickness). While the reason for using thickened liquids is to prevent aspiration pneumonia, there are very few studies that have examined whether they are effective at reducing this risk. A small, randomized controlled trial from 2011 monitored patients prescribed thickened liquids for dysphagia from conditions like stroke, neurodegenerative conditions, or cancer for development of lung complications like pneumonia. They found that patients allowed to have unthickened water had an increased risk of pneumonia, and patients with degenerative neurologic disorders and low mobility were at greatest risk. In summary, the research shows that thickened drinks, particularly honey-thick fluids, can reduce the chances of aspiration, but that patients generally prefer fluids that are less thick. Some patients appear to be more at risk than others so it is important to consider each patient’s preferences and risk factors when deciding whether to use thickeners and how thick to make them. What these few studies don’t evaluate is whether some thickeners are better tasting or more effective than others. That’s the next question. Whether you are working with elderly patients in a nursing home or other facility, or helping an elderly patient at home, you can buy pre-made thickened drinks or you can make your own thickened drinks with a powder or gel thickener. Pre-mixed thickened drinks are sold in single serve cups or in cartons or large bottles. They last about 6 months and don’t need to be refrigerated until they are opened. This is convenient – especially for elderly persons who would otherwise have to mix the product themselves. However, in addition to being expensive and coming in a limited number of flavors, these pre-packaged products tend to be thicker than drinks you thicken yourself and may not taste as good. As a result, the patient may just refuse to drink them, risking dehydration or malnutrition. Instead, you can make the liquid the thickness that works best for each patient by buying powder or gel thickeners. Most thickeners are either starch- or gum-based. Starch particles expand by capturing the fluid, which means they keep absorbing more liquid and get thicker after they are prepared. As a result, they may be too thick 20 or more minutes after they are prepared. They also get thicker when refrigerated. In addition, starches chemically interact differently depending on the fluid. For example, the acid in orange juice may thicken more quickly with starch but get thinner later, which is different than what happens if you use a starch thickener with water or apple juice. Gum-based thickeners usually must be vigorously shaken or blended with the base fluid to appropriately thicken it. However, if mixed properly, gum-based thickeners will maintain relatively stable thickness over time for many fluids. This could be important, especially for drinks that a patient may want to drink over a long period of time. However, be aware that some drinks, such as adult nutritional beverages, contain ingredients that may interact with the gum thickener and form clumps. How do gum-based thickeners taste, compared to powdered or pre-made products? 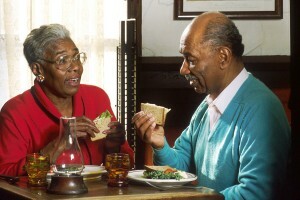 One small study found that elderly patients found thickened juice equally acceptable if thickened with a natural ingredient (raspberry apple sauce or chocolate pudding), powdered commercial product (Thick-It) or commercial gel product (SimplyThick), but patients much preferred hot chocolate thickened with chocolate pudding or SimplyThick. The authors stated that they selected Thick-It as the powdered brand because previous research and suggested it had better taste than other commercial powdered thickeners such as Quick Thick, Thicken Up, and Thick & Easy commercial brands. Since any of these products may improve over time, and different patients may have different preferences, it is worth trying different products to see what is preferred. In summary, thickening ingredients are safe and can be effective for reducing aspiration. However, more information is needed to determine which thickened fluids taste best and are more likely to be enjoyed by patients. In the absence of research on large number of patients, caregivers need to take the time to decide what products work best for their patients. The goal should be to make the fluids thick enough to be effective at reducing aspiration, and tasty enough to ensure that the patient drinks enough fluids every day. Garcia, J., et. al. Thickened Liquids: Practice Patterns of Speech-Language Pathologists. American Journal of Speech-Language Pathology. Vol. 14. February 2005. Garcia, J., et. al. Quality of care issues for dysphagia: modifications involving oral fluids. Journal of Clinical Nursing. Vol. 19. April 2010. Logemann, J., et. al. A Randomized Study of Three Interventions for Aspiration of Thin Liquids in Patients with Dimentia or Parkinson’s Disease. Journal of Speech, Language, and Hearing Research. Vol. 51. February 2008. Karagiannis MJ, Chivers L, Karagiannis TC. Effects of oral intake of water in patients with oropharyngeal dysphagia. BMC Geriatr. 2011 Mar 1;11:9. Garcia, J., et al. Managing Dysphagia Through Diet Modifications. American Journal of Nursing. Vol. 110. November 2010. Horwarth, M., et. al. Taste preference and rating of commercial and natural thickeners. Rehabilitation Nursing. Vol. 30. November 2005. Pelletier, CA. A comparison of consistency and taste of five commercial thickeners. Dysphagia. Vol. 12. Spring 1997.